Analyzing water samples for coliform and E. coli bacteria (Dr. Nicholas Nickl and brigade students observing). LEXINGTON, Ky. (Aug, 10, 2018) — During the Shoulder to Shoulder Global (STSG) brigade experience this summer, Wayne Sanderson, professor of epidemiology in the University of Kentucky College of Public Health, along with graduate students Eric Wilson and Danette Cook conducted a survey of 40 homes in the El Bua community outside Santo Domingo, Ecuador. Their research measured the 40 homes’ water sources for presence of coliform bacteria, such as E. coli. 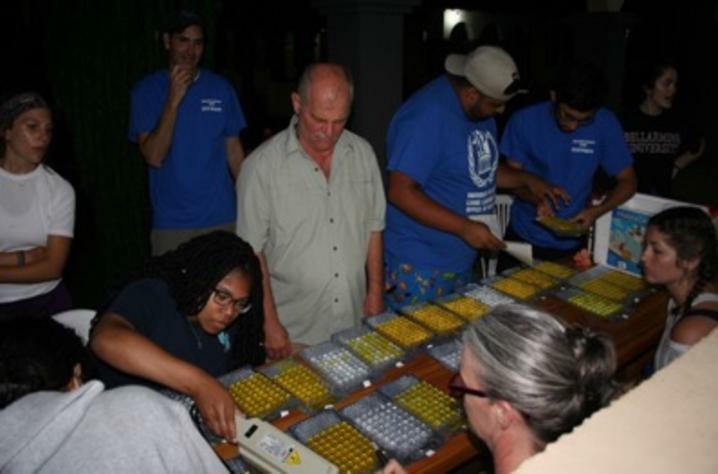 STSG, a University of Kentucky Global Health Initiative, has assisted over 20,000 patients during its past 11 years of service to improve the health and well-being of the Santo Domingo and Tsáchilas communities. Common health issues diagnosed during brigades include gastritis, chronic diarrhea and anemia. Sanderson said these symptoms are commonly caused by contaminated food and water and, after preliminary research, the suspected cause of the complaints was poor water quality. The researchers discovered that the wells and drinking water sources of most of the residents were heavily contaminated. The results of their testing, assessment of water sources and sanitation control, will be used to guide future interventions to improve the water quality in the community. Two UK research centers, the Central Appalachian Regional Education Research Center and the Center for Appalachian Research in Environmental Sciences, provided the training and equipment for the water quality evaluation. The efforts were supported by Marco Hernandez and Renee Thomas, seniors in the public health program, who collected water samples and served as the lab team during the brigade, as well as Dr. Nicholas Nickl, a retired gastroenterologist who aided during home visits. Tom Young, the founder of STSG, praised the students’ work in Ecuador as an example of how health professions can work together to solve complex global health problems.